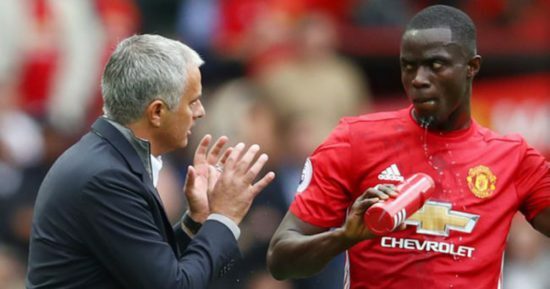 Manchester United could be without Ivorian defender, Eric Bailly for a long time as manager, Jose Mourinho has refused to give a definite date about his return from injury. Bailly, 23 has been missing from action for the past one month and there is a chance that he may not play again this season. The player last played in the 1-0 defeat to Chelsea away at Stamford Bridge. Mourinho says he picked up an ankle injury on international duty with the Ivorian national team, with summer signing, Victor Lindelof impressing in his absence. Bailly, who is regarded as United’s best central defender has been beset by injuries ever since joining Manchester United from Villareal. The player, who was relatively unknown on English shores before making the move to Old Trafford, has impressed every time he has played and this injury will be a bitter blow to our title hopes. While he has not been ruled out for the season, there is growing worry that surgery might only be the way to bring him back to prime condition. While Bailly will be missed, United know that we have players that can cover for his absence. United still boast the likes of Smalling, Lindelof, Jones, Rojo and Smalling that can all play in that position. Speaking on Wednesday after the 1-0 victory over Bournemouth at Old Trafford , Mourinho spoke about Bailly. He said, “I think his injury is serious, don’t know [how long he will be out] but his is an injury that comes from the last time he went with the international team and then we are trying a conservative treatment. “But, if the conservative treatment is not resulting, probably he will have a surgery procedure but let’s wait a little bit more,” he added. We hope he comes back soon and help our quest to make this season a huge success. Bailly is a central defender known for his calmness, reading of the game, and tackling ability. He joined United in a £30m deal from Villarreal last summer, the very first signing of the Jose Mourinho era.